Once, almost every business in Glenville was owned and operated by Jewish immigrants. Today, there is only one: Gordon Cycle & Supply Inc. on East 105th Street. Jack Gordon was the heart and soul of the business. Some thought his death at age 92 on Sept. 27, 2005, meant the end of the bike shop, but the legacy continues though his nephew Louis. "Uncle Jack died on the same day as his mother died in 1985," said Louis Gordon. "My grandmother, Anna, and Uncle Jack lived just about their whole lives in that house. I remember telling her a long time ago that the family would move her, that she could live anywhere in the world. She said, 'Fine, then I want to stay right here.' "
Gordon said the shop has lost money for eight years, but he wants to stick it out. "My grandparents, Louis and Anna Gordon, bought this house in 1919," he said. "They were Russian Jews who fled from the czar. I want to keep the business going until 2019, so I can say our family was here for a century. We stayed when everyone else left." Gordon plans to open a variety store next to the bike shop in the next few months. "I'll rent video games, sell snacks, but no alcohol or cigarettes," he said. "This will be for the kids." 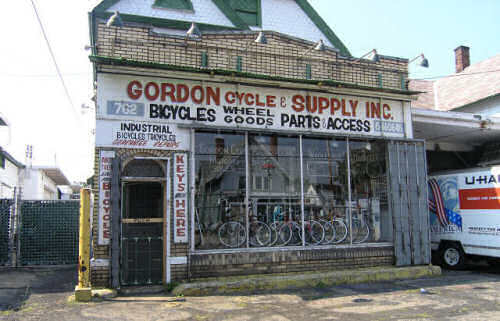 Gordon's bicycle shop is a Glenville institution, as much a part of the neighborhood as Superman, who was created by Glenville High School students Jerry Siegel and Joe Shuster just a couple blocks from the shop. Gordon has such respect for Superman and Glenville that he is offering the use of a building on East 105th Street for a Superman museum, rent-free for the first five years. "I grew up with Gordon's. Everyone did," said Cleveland Councilman Kevin Conwell. 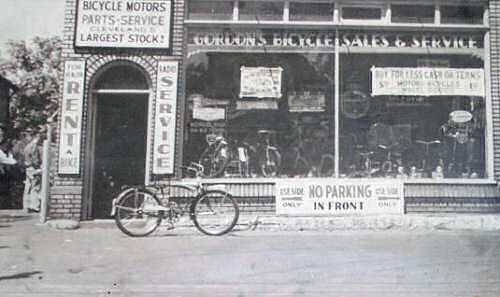 "Generations of African-Americans took their bikes to Gordon's to be repaired. Sometimes, Jack would fix them for free if kids had no money. He was a good guy, a great neighbor and he employed a lot of local people." Proof of local affection for the Gordons came in 1968. "There were riots in Glenville and buildings were being burned down all over, but no one touched Gordon's," Conwell said. "I never heard anyone say a bad word about him or his family. They brought nothing but smiles." 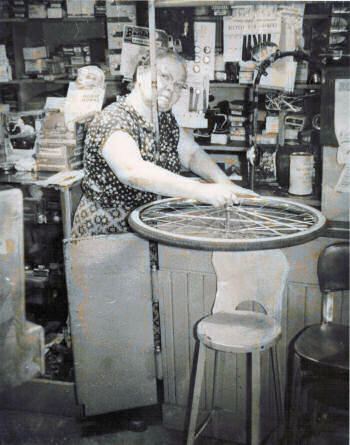 Louis Gordon said his Uncle Jack started repairing bicycles as a child. In 1925, Louis Gordon's grandfather, also named Louis and a plumber by trade, enclosed the porch of the house at East 105th Street and Kimberley and started repairing and selling bicycles. During World War II, Jack Gordon and Lou's father, Abe, enlisted in the service. The bike business kept going. "My grandmother and aunt kept the business going," he said. "My aunt [Sylvia Gordon] convinced the Murray Ohio Manufacturing Co. to let us become distributors. 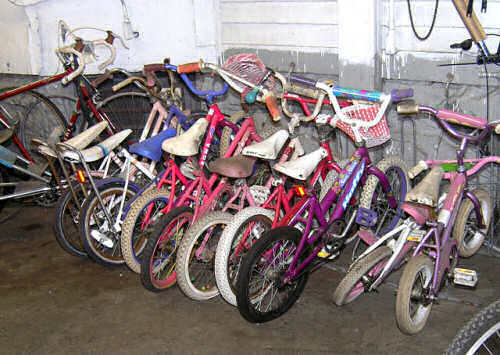 So instead of our store getting a couple bikes a week, we were getting hundreds and sending them to stores all over." After the war, the new generation of Jews left Glenville and moved to Cleveland Heights, Shaker Heights and University Heights. In 1936, Glenville was estimated as 70 percent Jewish, according to "Merging Traditions," a book by Judah Rubenstein. By 1950, the exodus was so complete that "Cleveland in general and the Glenville neighborhood in particular, were described as 'a city without Jews,' " the book says. But Jack and Anna Gordon and their bicycle shop stayed. Cleveland Councilwoman Sabra Pierce Scott remembers buying colorful, plastic streamers for her bicycle as a child from Gordon's. "I nominated Jack Gordon for the Glenville Wall of Fame and I was so pleased he was able to attend the ceremony," she said. "They are the last Jewish business in Glenville by far. Greenstein's hardware store on St. Clair near [East] 91st Street closed up 30 years ago." 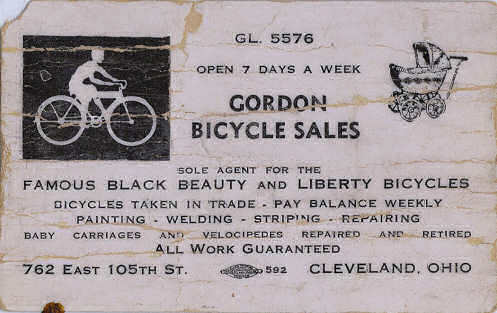 Gordon said his uncle had a unique, old-fashioned way of doing business. "Uncle Jack was great, a real character," said Gordon. "A guy would come in and want to buy a $300 bike for his son. Uncle Jack would argue that he should buy a used bike for a lot less. He said that customer would come back for repairs for the rest of his life." Over the years, the Gordon family bought adjoining properties. They now own five lots on East 105th Street that go back about 200 feet. The unassuming buildings on the street are gateways to 10 more buildings in the back, about 600,000 square feet of houses and warehouses. Jack Gordon never threw anything away. After his uncle's death, Lou Gordon found bike merchandise dating back decades, which he now sells on the Internet. "It's amazing that adults want to recapture their youth so much that they will buy things like banana seats they could not afford as children," he said. He plans to hold an antique auction at the bike shop on Nov. 3, 4 and 5. For further information, contact the bike shop at 216-681-0648. Copyright, 2006, The Plain Dealer. All Rights Reserved. window gates or fences were needed to protect the property. of the time, the store was open seven days a week. Note the "bug" showing that the card was printed by union labor. 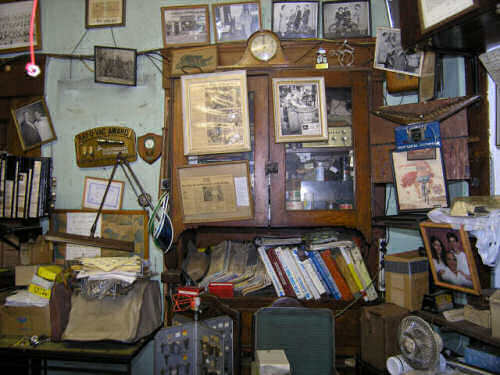 Jack Gordon's office, originally the dining room of the Gordon house moved into in 1919. In the next room is a newer office, with computer and internet access. A larger image of Lou Gordon's grandmother is shown below. a bicycle wheel ca. 1975. Born in Lithuania in 1889, she moved into this house in Glenville in 1919 and was active until her death at 96. 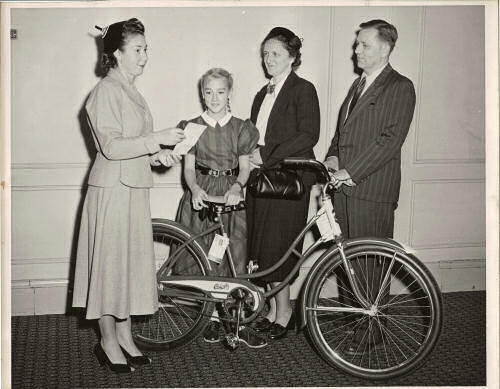 Lou Gordon's Aunt Sylvia Gordon (later Greenspoon) sells a customer a new bike in the 1940's. She graduated from Glenville High School, then Baldwin Wallace College. Sylvia secured a wholesale distributorship from bicycle maker Murray Ohio. Later she would marry and move to Norfolk Virginia where she and her husband owned a motel. 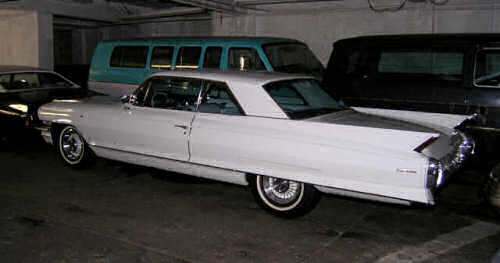 The 1962 Cadillac Coupe de Ville Jack Gordon bought in 1963. It still has the plastic seat covers he had installed over the brand new car's leather seats. He drove until he was about 91 years old, driving the Cadillac only occasionally until 1992. Lou Gordon calls the car "Cadillac Jack". Photos: Arnold Berger Scans of old photos by Lou Gordon. and the buildings surrounding it and for furnishing these captions.